Sweet bread toast recipe also known as Bombay toast is a delicious evening snack prepared with sweet bread slices dipped in a mix of milk, egg and sugar and then toasted in a tawa using ghee. Whole wheat bread can be used to make it more healthy which increases protein and fibre content of the dish. Sweet bread toast is somewhat similar to french toast with a little variation in ingredients and preparation method. 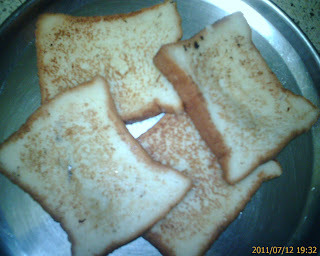 This bread toast is a popular street food in India and you can find plenty of variation in each part of India. Try this healthy sweet bread toast recipe and Enjoy Cooking!!! Sugar 10 tbsp or required. 1. Beat egg well. Mix Milk, Egg and sugar well to make a loose mixture. 2. Dip the bread into this mix for few seconds . The mixture should be coated on both sides of bread. 3. Fry the dipped bread with ghee in a non stick tawa. 4. Serve hot with sugar or any fruit jam.